This article describes chimney top repairs for masonry chimneys and clay flue tiles, work performed at or from the rooftop. This website provides detailed suggestions describing how to perform a thorough visual inspection of chimneys for safety and other defects. Chimney inspection methods and chimney repair methods are also discussed. Our photo above shows an unsafe chimney that was still in active use. Notice those missing bricks and lost mortar? Damaged chimney top masonry such as missing bricks and a missing chimney cap were easily spotted from ground level, raising a critical concern for the fire and gas-leak safety of the clay flue tiles lining this chimney. At the front left corner of the clay chimney flue tile you can see our pen inserted into an opening between the chimney flue tile and the (damaged) surrounding brick and concrete chimney structure - water entering the chimney structure at this location risks freeze damage to the chimney flue itself, resulting in potentially very dangerous conditions. First, you will want to be absolutely sure that the chimney damage, whether to the ceramic clay flue liner or to the surrounding masonry or both, is limited to the upper, visible, accessible part of the chimney. Our chimney clay flue tile liner damage photos above show enough wear and cracking (above left) and opening between clay flue tile liner sections (above right) that further inspection and repair by a chimney professional is warranted. Other chimney damage lower in the chimney itself as it passes through or alongside the building could be very dangerous, even fatal if carbon monoxide or other flue gases leak into the building or if sparks cause a fire. Our photos above show damage to the chimney clay flue tiles near the chimney top, with multiple cracks in the clay flue liner (above left), and severe spalling in the clay flue tile liner (above right) -these are two different chimneys. Both need repair. The right hand chimney (above right) may need a complete re-lining while the chimney at above left might be damaged only above the roof line, making roof top repair a reasonable approach. We suggest that you hire a professional chimney sweep who can examine the entire chimney flue. Most chimney sweeps also offer repair services, and can suggest what repairs are needed and give alternatives for the particular chimney and flue on your building. Our photo of spalling brick near the top of this masonry chimney (left) shows damage almost certainly caused by frost. Without a view of the chimney top, however, we don't know exactly where water was leaking into the structure, nor the condition of the flue liner itself. It is the condition of the fire clay (or as some call it "ceramic") flue liner that is of course critical to safe venting of flue gases outside. Some chimney repair contractors will want to reline the whole chimney flue - an approach that is often safe, quick, easy, and profitable. But this approach may be inappropriate if the damage is just due to weather at the chimney top and the rest of the flue is intact and safe. Water leaking between the flue liner and the masonry surround is also a very common cause of water and frost damage at the chimney top. Most often we see spalling flue liners and loose or damaged bricks or concrete block around a chimney top caused in large part by failure to protect the chimney to from the weather; lack of an allowance for thermal movement among chimney parts, especially the liner and the surrounding masonry,can also crack and break the flue liner, especially on the above-roof portion where the chimney is in northern climates exposed to coldest temperatures. Potentially, damage to the masonry chimney structure as well as to its clay flue tile liner can occur also inside a freezing attic space. Some people try patching the damaged areas of the chimney top or chimney flue with refractory cement but we don't recommend applying "patches" to the interior of a chimney flue: there is a risk that the "patch" might later fall into and block the flue - a very dangerous condition. A better approach and the one used by most chimney repair masons who are not going to simply reline the flue, is to remove all of the damaged materials down to sound chimney flue liner and brick or block, then rebuild with new clay flue liner and brick (or block), adding an appropriate chimney cap and top seal. Using solid masonry between the clay liner and the surrounding masonry at the chimney top is a common practice (photo at left), and having inspected quite a few chimney tops, we can't say that every chimney built this way fails, but it is not the best practice and is not recommended by experts. Our chimney top photo (at above left) shows that this roof top chimney seal is already cracking, threatening future damage to the chimney flue liner as well as the chimney structure at roof top. Other problems at this chimney top include the termination of both flues at the same height, and the absence of any rain cap. Using a fire-safe flexible caulk at that joint will reduce the chances of cracking due to temperature differences. Carson Dunlop Associates [at REVIEWERS] sketch ( above-left) show some details of good chimney cap construction. The object of these details is to avoid water and frost damage to the flue or to the chimney itself. 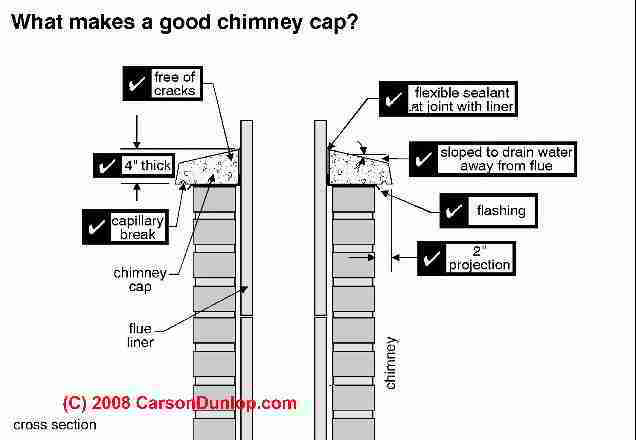 See CHIMNEY INSPECTION ROOFTOP for these chimney top inspection and final repair and sealing details. Continue reading at CHIMNEY REPAIR METHODS or select a topic from closely-related articles below, or see our complete INDEX to RELATED ARTICLES below. 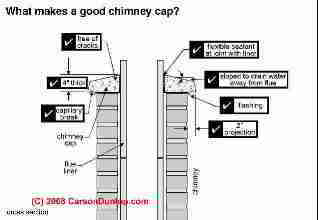 CHIMNEY REPAIRS, TOP & CLAY FLUE TILE at InspectApedia.com - online encyclopedia of building & environmental inspection, testing, diagnosis, repair, & problem prevention advice. I have been told by a chimney sweep that i have a liner that is suitable for an open fire. Would this be adequate for multi fuel stove (wood and coal) and if so would i need any lining further down the chimney to connect a stove to the chimney. When talking to or reading up on manufacturer websites it seems that they advise a lining which can cost almost as much as the stove. Is this necessary? 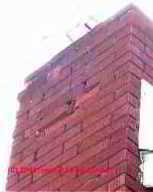 When I have peered into the chimney myself I cannot see any liner only bricks but there is a bend in the chimney and i cant see all the way up to the top; do you think there still is one there or should i get a second opinion? If so how can I get an independent one from someone who is not trying to sell me something? Thanks. Sarah if you see only bricks, at least part of the chimney is unlined. Still we don't know it's safety - for example we don't know if the chimney is built with a single brick (wythe) thickness or more bricks were used. 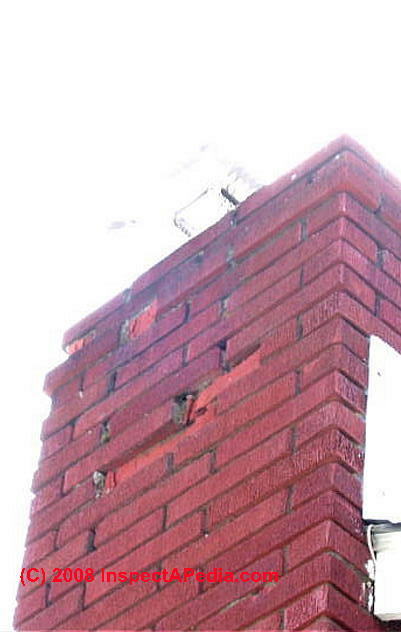 A single-brick wythe chimney would be unsafe for most applications. I'd call a different chimney sweep and get more explicit details on the chimney construction, materials, condition, and safety before I'd consider using it. Chimney fires are really dangerous and not something on which to risk a short cut. Perhaps a sweep certified by one of the certifying agencies would be more reliable. I would IMMEDIATELY STOP USING THAT SYSTEM AND CHIMNEY - you are describing what sounds to me to be a very serious building fire and flue gas leakage hazard. Indeed, on 12/31/1969 I was in a house that caught fire afber being preceded by just about the same symptom. You need the chimney inspected by a professional chimney sweep who can examine the entire flue interior and tell you what work is needed. Probably reconstruction or relining. Birds might block the top of the chimney - that's bad enough, but smoke coming out of the wall above the fireplace means you are about to burn your house down. Questions & answers or comments about repairs made at the portion of chimneys that extends above the building roof.
. Copies of earlier editions of the ASHI Technical Journal are available from ASHI, the American Society of Home Inspectors. Ceramic Roofware, Hans Van Lemmen, Shire Library, 2008, ISBN-13: 978-0747805694 - Brick chimneys, chimney-pots and roof and ridge tiles have been a feature of the roofs of a wide range of buildings since the late Middle Ages. In the first instance this ceramic roofware was functional - to make the roof weatherproof and to provide an outlet for smoke - but it could also be very decorative. The practical and ornamental aspects of ceramic roofware can still be seen throughout Britain, particularly on buildings of the Victorian and Edwardian periods. Not only do these often have ornate chimneys and roof tiles but they may also feature ornamental sculptures or highly decorative gable ends. This book charts the history of ceramic roofware from the Middle Ages to the present day, highlighting both practical and decorative applications, and giving information about manufacturers and on the styles and techniques of production and decoration. Hans van Lemmen is an established author on the history of tiles and has lectured on the subject in Britain and elsewhere. He is founder member and presently publications editor of the British Tiles and Architectural Ceramics Society. Available at the InspectAPedia Bookstore. NFPA #211-3.1 1988 - Specific to chimneys, fireplaces, vents and solid fuel burning appliances.